Billy Bang left us six months ago, but we´re not quite done with new additions to his catalog. TUM Records, the Finland-based label who last year brought us the last Bang-led record released in his lifetime, will on October 25 free up a recording he did in late 2005 with the FAB Trio. The FAB Trio wasn´t some Beatles tribute combo, not hardly. It was a supergroup of like-minded vets of the NYC loft scene who played together on and off over the last decade. Bang, bassist Joe Fonda and drummer Barry Altschul had some history amongst them already: both Altschul and Fonda played in Anthony Braxton´s bands, the former in the 70s and the latter during the 90s. Altschul and Bang knew each other since they were teenagers growing up in the Bronx. So, by the time the three got together to make their first album, Transforming the Space (2003), they knew just how to play together. Two live records followed, and just as the tapes from their 2005 studio session were getting prepared for release in April, 2011, Bang passed away. 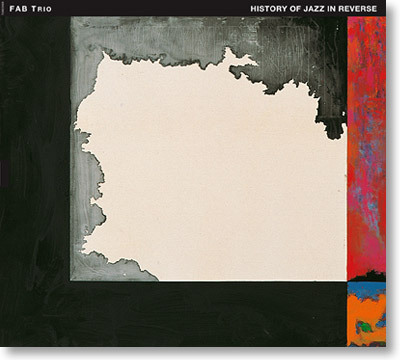 History Of Jazz In Reverse, as this new record is called, doesn´t require a death to appreciate. Recorded live in the studio following a tour, there´s an affinity that can only develop amongst masters familiar with each other: Altschul and Fonda are often the guys going off and playing free whilst Bang is weaving the melody. Sometimes they manage to coax him out to cut loose, which he does in a very gratifying way at the end of "From Here To There." "Implications" is attractive for Altschul´s funky progressions that retains the beat but carries over nothing else from one moment to the next, as Fonda and Bang create adornments around it. It´s also interesting to hear Compay Segundo´s lovely ostinato "Chan Chan" played here, just months after Bang recorded this song with his quintet for Prayer For Peace. On this version, Altschul makes up for two less players with his sharp kit work, deftly manipulating the rims and tom toms in a modulated way that makes his presence well known without having to bash his drum set into submission. "History Of Jazz In Reverse" features Fonda on bowed bass for part of the song, the effect creating an appealing pairing up with Bang before he puts down the bow and joins with Altschul on the groove. I don´t know if there are any more unreleased treasures of Billy Bang recordings yet to see the light of day, but no more is required to cement Bang´s legacy as a jazz violinist who forged his own path and enhanced avant garde jazz in the process. All History Of Jazz In Reverse does is confirm what a big loss to the jazz world his death is.